The well capabilities to produce the oil determine by the diameters and the depth. When the rig gets deeper, the needs of treating the drilling fluid become more complex. The system might need several tanks and sets of drilling mud shale shakers to rotate. Desander hydrocyclones and desilter hydrocyclones pair with shakers at the bottom to take the treatment in the next level. Last is decanter centrifuge will remove the remain solids and return the cleaned drilling fluid back to the tank. For HDD industry, the typical drilling doesn’t so deep compare with oil drilling. Therefore, the single tank and single set of solids removal machinery on top of the tank will serve the purpose. The treating capacity (gallon per minute, GPM). It is the next fact need to take as consideration after the size of rig which is the rate of feeding pumps determine GPM. The typical GPM output is 1 to 1.5 because it’s based on the specs of clear water. When viscosities, solids loading and polymers enter the picture, this ratio will allow some room for the system to keep up. The GPM and penetration rate are in direct control of solids loading, which should be kept around 10 to 20 percent by weight of solids. If the mud in the return pit is above 35 percent solids, it will cause unfavorable conditions for a reclamation system to separate solids effectively. The system is long term uses purchase and sometimes it moves by contractors where the site will be. The variety of soils that job site have will be determent the process of drilling. Solids control machinery MFG will balance the pump sizes to reflect the throughput volume. In regions where fine sands or sugar sand is the predominate soil, de-sanders may be used to take loading off the desilters. Regions where clay, sands stones or shale is the majority of soil conditions that are encountered. 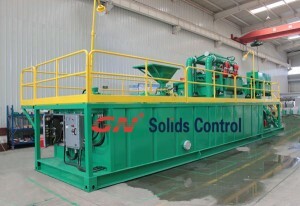 For the larger rig that can add the operations cost of a decanter centrifuge and it will help lower the clay build up. It keeps the mud weight down to a usable level and lower the percentage of destructive low gravity solids.